There can be no doubt that this and Sale 3, lot 90 are both by the same hand. 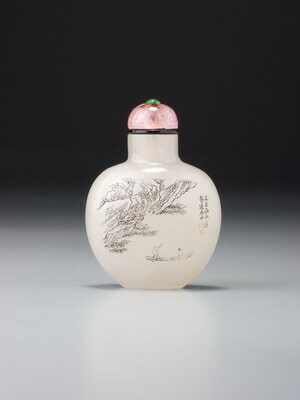 The natural wear to both glass and enamels is commensurate with regular use over a period of time, although the bottle is not as badly worn as some of the group. 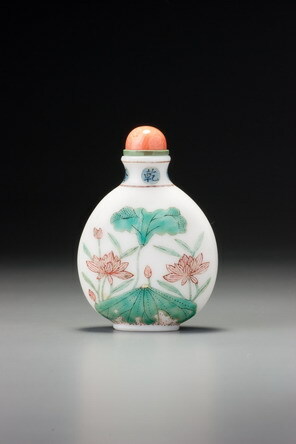 The green enamel is slightly pitted with burst bubbles from the firing, which is found on most early-Qianlong green enamel on glass and a good deal on pieces from the mid-reign. It has the combination of a Qianlong reign mark and the Guyue xuan mark that occurs on several of the earlier wares of the group. The inscription in the neck-to-shoulder border is a departure from the standard practise prior to 1767, but common to the earliest wares of this particular group – it is found so far on five of the bottles from 1767 and two undated examples reasonably attributable to 1767, of which this is one, but not elsewhere.